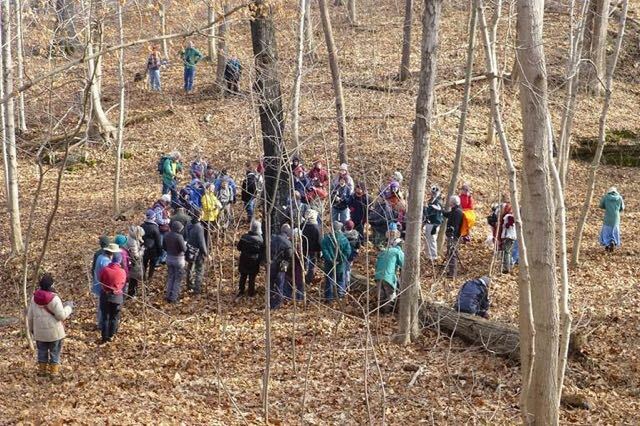 Many thanks to all the participants, over 60 in all, who made the December 21, 2014 Winter Solstice Field Trip and Hooley at Ferry Hill, Washington County, Maryland such an enjoyable and memorable outing! Revelers in Rich Cove Forest at Ferry Hill, Washington County, Maryland. Photo by Steve Young. This event, traditionally held at one of the region’s old-age forest communities, is always a great way to welcome the winter season. The usual line up of sponsors was in effect again this year; the Potowmack Chapter of the Virginia Native Plant Society, the Maryland Native Plant Society, and the Botanical Society of Washington, D.C. Special thanks to field trip co-leader Carole Bergmann; to Greg Zell, who with expert assistance from the Maryland, D.C., and Virginia tree stewards and foresters, measured and scored the notable and champion trees on site; and to the numerous folks who assisted along the way, including all the wonderful photographers! 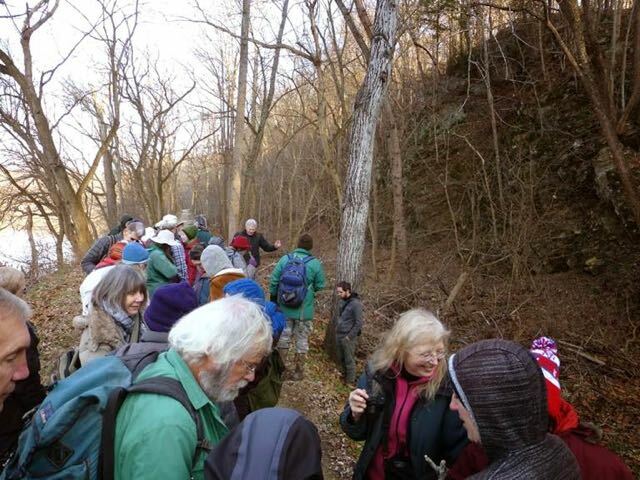 Winter Solstice Field Trip participants along the ridge trail that traverse sections of old-age Rich Cove Forest at Ferry Hill. 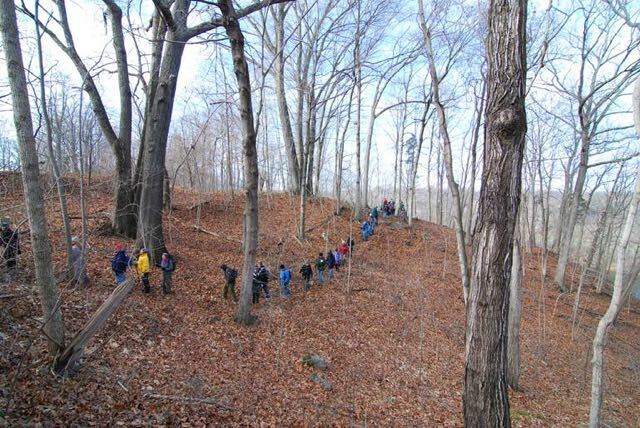 Sugar maple, (Acer saccharum), and black maple, (Acer nigrum), are the dominant understory trees throughout the site. Three-lobed, thick, dark green, veiny leaves are characteristic of the black maple, while sugar maple typically has five-lobed, thinner, lighter green, and not prominently-veined leaves. 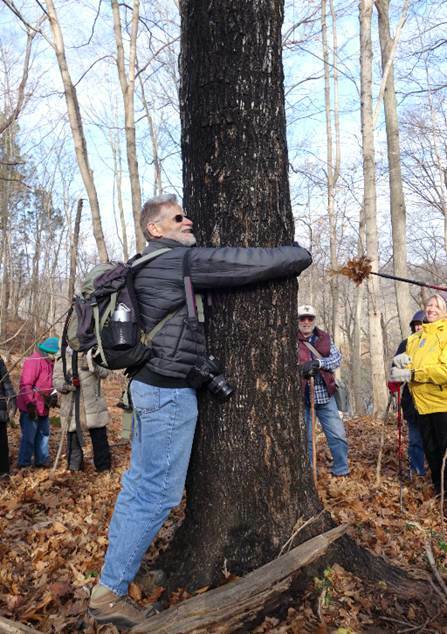 Apparently, the sooty, dark bark is caused by heavy “attacks” by sapsuckers, with the resulting sap flow providing a food base for the fungi (see: Black bark as an indicator of bird peck defect in sugar maple). 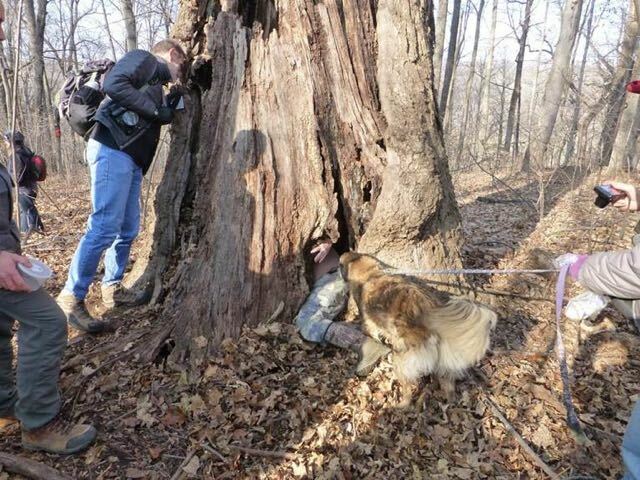 This is pretty much the situation described by Arlington-Alexandria TreeSteward and Smithsonian entomologist emeritus Ollie Flint during the walk, though with a New Zealand species of tree. 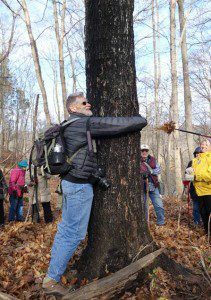 Next we see Greg Zell getting help from everyone as he prepares to measure the new State Champion Black Maple. The tree has a circumference at breast height (CBH) of 5′ 8″; a crown spread of 46′ x 40′; a height of 85′. The total number of points gave the tree a score of 163 points. An ancient, double-trunked cucumber-tree, (Magnolia acuminata), in a rich cove at Ferry Hill. This was the smaller of the two giants seen on the field trip, with a CBH of 12′ 8″; a crown spread of 47′ x 44′; a height of 109′; and a total score of 272 (total points). We also measured the new state Co-Champion cucumber tree on this day; the larger of the two giants seen on the field trip, with a CBH of 17′ 4″ (measured at 18” above the ground); a crown spread of 53′ x 31′; a height of 129′; and a total score of 347 (total points). This ancient, forest-grown tree was measured at 18” above the ground because it is situated in an upland drainage swale along the west slope of the cove and rainwater runoff overlong periods of time has eroded some soil from the basal trunk, resulting in massive, raised, multi-trunk-like roots. The site of a Co-Champion! What a perfect place for December 21, 2014 nemeton! Yes, they did. Greg Zell and Kathy Bilton’s beastie crawling into a completely hollow but perfectly healthy, ancient tulip tree, (Liriodendron tulipifera). This tree had nearly 20’ CBH. 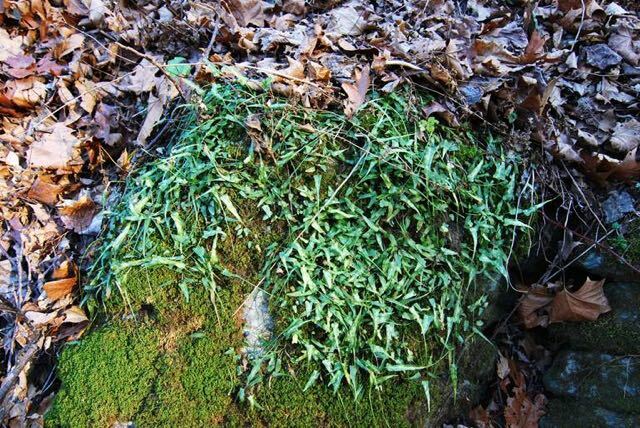 Evergreen colony of Walking Fern (Asplenium rhizophyllum) on limestone at Ferry Hill. Photo by R.H. Simmons. 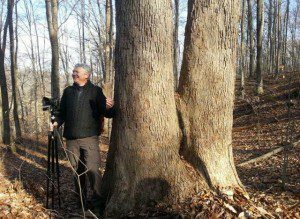 Smithsonian entomologist emeritus and naturalist extraordinaire Warren Steiner (left foreground), discovers a large butternut tree, (Juglans cinerea), along the C&O Canal towpath. Arlington County Forester Vince Verweij marks the spot. 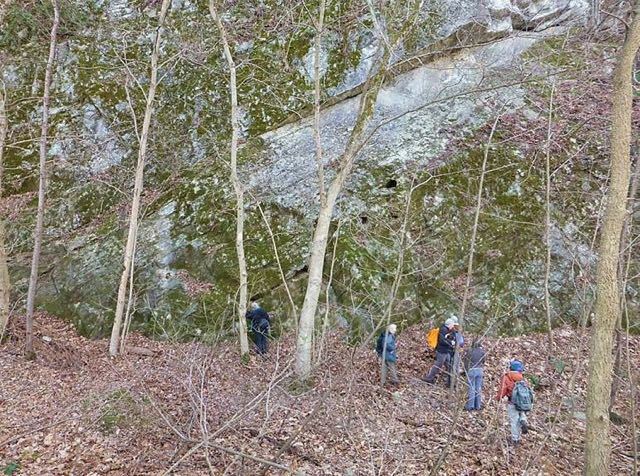 Massive, near-vertical limestone and dolomitic cliffs along Potomac River C&O Canal at Ferry Hill. Photo by Steve Young. For more photos, check out Steve Young’s “solace of solstitians” photos: Solstice Walk at Ferry Hill Farm. 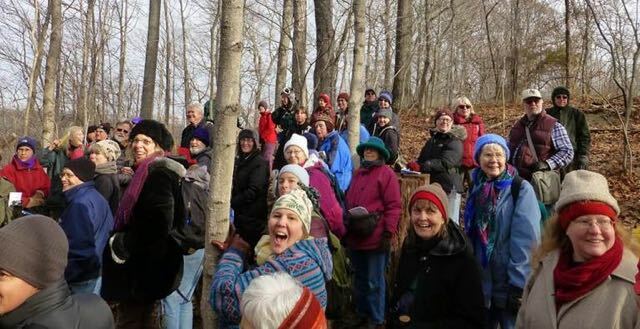 Hope you’ll join us on the Winter Solstice and Hooley next year!